TMJ Dentist in Burtonsville MD - TMJ Pain Specialist? TMJ Dentist in Burtonsville MD – TMJ Pain Specialist? What are the most common symptoms of temporomandibular joint disorder? Are you looking for a local doctor who specializes in non-surgical treatment options for jaw pain and headaches? Dr. Gary Adams is a dentist who specializes in temporomandibular joint dysfunction and works with people who clench and grind their teeth. How to stop jaw clenching and teeth grinding? One common device we use in our practice is the Vivos DNA Appliance. Searching for TMJ Dentist near me? What separates our practice is our special focus in problems that involve pain and symptoms related to jaw joint disorders. Our goal is to correct the underlying cause of the problem. Recent advancements in treatments provide much more than temporary pain treatments like night guards. Our unique holistic approach to therapy gets people better. Without the need for surgery. The key to success is identifying the cause of the temporomandibular pain and using targeted therapies and exercises to improve the problem. Dr. Adams will determine the source of your jaw pain and problems. He then develops a treatment plan that provides a solution to all your pain – not a piece of plastic you sleep with for the rest of your life. “One of the best TMJ appliances is the DNA Vivos appliance device” The difference in the DNA Appliance and most other appliances is that the DNA appliance corrects many of the most common causes of TMJ. For example, 1) space available for the tongue 2) Jaw balance, 3) Jaw Position 4) some aspects of how the teeth fit top to bottom. The DNA if designed properly, can get people better. By contrast, most other appliances and treatments will result in an appliance worn indefinitely at night time. Conventional appliances such as night guards will slow wear and tear on the teeth, but clenching still occurs on the appliance. Normally people will stop wearing night guards because they are not comfortable. Often night guards cause more clenching since they take up valuable space in the mouth, crowd the tongue and provide no balancing effect for the bite and jaw muscles. Sleep Apnea – The appliance helps the jaws grow larger, creates space in the jaws and facial bones for proper breathing, tongue space and position. Upper Airway Restriction Syndrome (UARS) is caused by a small mouth, small nasal passageways and crowded tongue, teeth and tonsil spaces. Clenching is often the body defending your airway from obstructions such as a large tongue. During deep sleep all the muscles in your body relax and become flaccid including the tongue. When the tongue does not have enough space to fit properly in the mouth, it settles into the throat and gets in the way of night time breathing. That is when the clenching starts and you wake up into a lighter sleep. In lighter sleep, your tongue regains its muscular tone and comes out of the airway. In deep sleep, the tongue is relaxed and flaccid at which point it goes where it fits which is deeper into the throat. 77% of people who clench their teeth during UARS, do not know they are doing so. When the problems get much worse, the symptoms of TMJ start to become more noticeable. People who suffer from UARS symptoms should be tested for sleep apnea. 77% of people with sleep apnea suffer from severe TMJ symptoms. Vivos DNA appliance therapy is just what the doctor should order. It will balance the jaw relationship and open up space in the mouth and upper airway for better tongue space and breathing. Bad Bite that is not comfortable. When spaces in the mouth are tight, the teeth tend to fit poorly and the bite is not comfortable. A bad bite alone is sometimes enough to cause tooth clenching and painful jaw joint and muscle symptoms. Stress and poor work conditions are major contributing or exacerbating factors, but they do not cause symptoms or pain alone. DNA appliance therapy is a novel treatment. The jaw device balances the bite and opens small obstructed airways by stimulating them to grow wider internally. The appliance has many uses but Dr. Adams uses it in many cases to correct and cure the conditions that cause TMJ pain and UARS disease. The temporomandibular joint is the joint that literally connects the jawbone to the head. The jaw bone is the mandible and the head consists of several bones including the maxilla, zygoma, sphenoid and temporal bone. 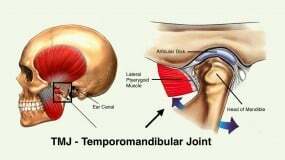 tmj is an acronym for temporal mandibular joint or literally the joint that connects the mandible (lower jaw) to the temporal bone at the base of the head. The joint is located and a crevice in the temporal bone called the glenoid fossa. The joint rotates and slides down and forward in its open position. It is the only joint in the body capable of 3D movement. All other joints in the body either hinge open and closed or rotate in a socket. The temporomandibular joint is the most complex joint in the body. The neuro-musculature about this jaw joint plays a key role in overall posture and dictates how the head sits on the vertebral column. Paradoxically, while the discussion is “tmj-tmd”, the problem or symptoms we call “tmj” normally are caused by dysfunction in areas surrounding the joint with impact on the entire body. That is, the jaw-joint itself is rarely the actual problem or the true source / cause of the pain. Treatment and therapy to all the anatomy and function surrounding the jaw joint is the key to treatment and every case is not the same. The approach to treatment will rarely be the same from one person to the next who has this problem. Most of the painful symptoms stem from poor jaw position and tooth clenching, but the million dollar question is “why do people clench their teeth?” “How can we correct the cause of tooth clenching?” How can we create rest, space and comfort about all this head and neck tension? The answer lies in the balance between the biomechanics of the jaws, the fit of the teeth, the physiology and function of the upper airway and the tongue, sleep and vertebral posture. How are Jaw Disorders Diagnosed? how the teeth fit top to bottom to determine if the bite is off. range of motion of key joints including jaw joints, neck, shoulder, ribs and hips. Treated with physical therapy, bite appliances, orthopedic appliances. We often use the DNA appliance which does all of these things. Sometimes the use of a Gelb appliance and bite splints is necessary in extreme cases. We generally try to make it our goal to diagnose the root cause of symptoms and perform treatments that are corrective. We hope to re-establish and re-develop the anatomic and physiologic positions and functions where the patient will be stable, comfortable and out of pain. Dr. Adams has earned respect in the Washington DC and Baltimore areas as a temporomandibular joint dysfunction specialist. Teeth and Jaw Clenching link to Sleep Apnea? Yes. 77% of people who have Sleep Apnea have temporomandibular pain. The root cause of symptoms is related to airway problems and improper breathing function at night time. When there are night time airway problems, it initiates the clench reflex and here in lies the cause of all our problems. 80% of people who “clench their teeth” do not know because they are asleep. The clench reflex usually does not wake the person up all the way but rather into a lighter sleep where the tongue and other “obstructions” regain muscular tone and the airway becomes mostly patent again. This is a very complex syndrome but the overall concept is simple: bad airway causes clenching and tons of neuro-muscular tension, posture problems and dental damage. TMS patients have often seen many professionals including neurologists, chiropractors, physical therapists and ENT doctors. Many times the diagnosis is missed or the patient receives migraine drugs for headaches from the neurologist. TMS symptoms can be treated and cured by a properly trained and experienced specialist. Night Guard for TMS Therapy? Leading TMJ therapy dentists do not recommend night guards as a remedy for TMS. There is no miracle device for therapy. To get better, a specific diagnosis and treatment plan is necessary if you want to get better. If someone does not have the time or money to do corrective treatment, a night time appliance may be a good temporary solution to help with painful symptoms. A night guard is a piece of plastic or acrylic that is made using the patients current bite path of closure. It is typically a little more balanced but does not involve a corrective change in the patients present bite path. A Splint is an appliance that makes a change to the path of closure and is corrective in nature. A splint is usually made after a detailed evaluation of the patients present bite, a diagnosis of what is wrong and the appliance has a new bite path and position that should be a more restful place for jaw joints and muscles. A splint is an orthotic and does not make any permanent changes to the patients mouth or teeth positions. The purpose of a splint is to establish a new more correct bite position and relieve the patients symptoms. Often more definitive treatment like a Vivos DNA appliance. Therapy is performed after successful splint therapy. A night guard usually is of little to no value for TM therapy. A mouth guard is more appropriate for sports applications, etc. 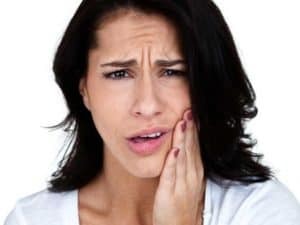 Why Should TMD be Treated? The upper teeth sit in the base of the human skull and directly in front of the entrance of the spinal cord into the brain cavity and directly underneath the Pituitary Gland. The longterm consequences of TMJ-oral facial disease is dental breakdown, airway failure including sleep apnea and full-body postural failure including muscular and skeletal dysfunction and breakdown especially in the head, neck shoulders, back and hips, increased stress, hormonal dysfunction and metabolic issues. Increasingly patients with facial pain are found to be victims or poor pediatric facial development and or incomplete /difficult orthodontics involving tooth extractions, retraction and or aggressive palatal expansion. Many can be relieved with DNA Appliance Therapy. 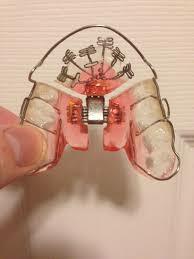 The DNA device can reverse some of the negative effects of retractive orthodontics. In some more severe cases of TMJ there may be joint breakdown. In these cases a joint vibration analysis and CBCT Cone Beam Scan of the joints is indicated. joint vibration analysis is a technique created by Dr. Piper for purposes of determining the condition of the joint and the capsular disc. Very few cases will need surgery, but sometimes surgery may be necessary if the TM joints are damaged and do not function properly. Untreated TMS can lead to TM joint breakdown and the need for surgery of the joint and capsular disc by an oral maxillofacial surgeon. What Kind of Doctors Specialize in TMD Therapy? The is no such thing as a TMJ dentist as a matter of credential. Some of the doctors who may have training in TMD are: general dentists, oral surgeons, prosthodontists, physical therapists, osteopaths. We believe the best approach is the team approach of dentist and often a special physical therapist. Neuromuscular dentists use instruments to measure jaw movements via Computerized Mandibular Scanning or CMS. Jaw motion analysis (JMA), electromyography (EMG), Electro-Sonography or ESG, and Joint Vibration Analysis or JVA help in identifying joint derangements. Transcutaneous Electrical Nerve Stimulator TENS can be used to relax jaw muscles to better examine jaw movements.